The Audit Log contains information about all events that have occurred on the LEAPWORK Automation Platform. This includes editorial events as well as the running of flows using scheduling, the REST API or by any other method. Only users with the Administrator role can access the Audit Log and are allowed to filter, search, and export log data. The Audit Log can be used for internal as well as external audits and can serve as a tool to debug unusual events and scenarios. The Audit Log allows advanced filtering and sorting options. The basic filter is a From and To date, which per default is set to 'Today'. To change the dates, open the date pickers, and click 'Load'. To go back to the default dates, click 'Reset'. Event, for example “Create flow” or “Delete image”. Affected asset, for example the flow affected by the change or the image deleted. 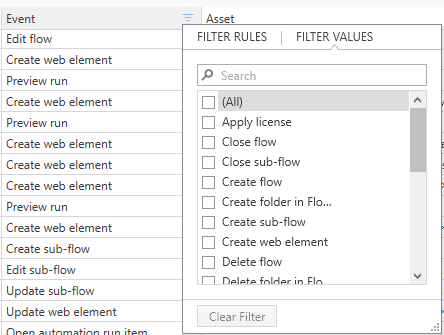 For Rule-based filters, you can add a pattern which the values in the column must match. For example, open the Filter dialog for the 'User or system' column. Select 'Begins with' in the first dropdown, and then specify “ad” in the second field. This will filter the log, so only entries where the user or system name start with “ad” is shown. For the Value-based filters, you choose between the existing values in the column, and can select one or more of them. All added filters are shown in a list at the bottom of the log. 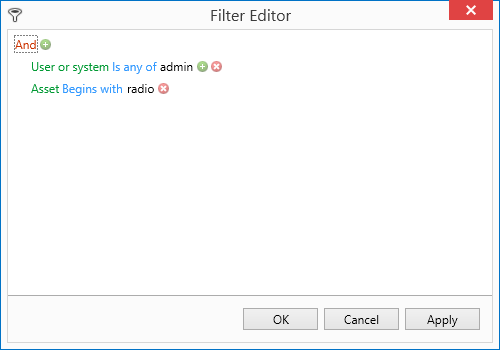 This helps to maintain an overview of the filters and gives a fast access to edit the filters using the Filter Editor. The name of the Asset (i.e. the flow or sub-flow) should begin with the word “radio”. To change the filters simply click on the part you want to change and select/enter a new value. By clicking 'Apply' the new filtering is applied to the log. Alternatively, you can open the individual filters by clicking in the column headers as described above. The audit log can be exported into Excel, HTML, or PDF format in case the data is needed outside LEAPWORK. Click 'Export' to save the log data – respecting any added filters – in one of the three formats.